When you’re “going through it”, life can be a deathrace that hijacks your focus. Keep Moving. Stay Safe. Wake Up. Take a Bath. Do Your Best at Work and Home. Remember to sleep and eat. Pay a Bill or two. As the danger passes and focus has a chance to shift from fleeing to being, you might find an inkling to abandon your comfort zone and learn something new…like golf. Yep. I’ve signed up for golf lessons (three lessons to be exact). Just the thought makes me giggle. For weeks, I’ve carried around a ripped-out page of the UFM catalog. UFM is a local community-learning hub offering classes both for credit and for quality of life. It happens to feature golf lessons for folks who have no clubs and – in my case – no talent. I hate to look foolish and avoid inviting foolishness at all costs. But something about golf and having been told that I’d never be good at golf because of this or that, has me thinking it’s time to take a swing at it. Fellas I’ve dated before have risked life and limb to show me how to play. Kenan and I used to occasionally buy a bucket of balls and aim for the trees, turkeys, but mostly the customized ball-collection truck. He improved. I did not. 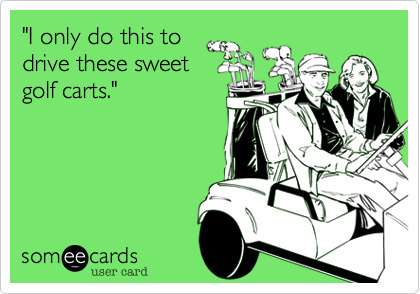 So much so that at least once a stranger approached me with such pain in his voice and asked if he could please help me improve my golf game. That may or may not have been the time the club exited my swing and ended up on a car in the parking lot. Anyhoo, I called this morning to sign up and subtly ask if the instructor was a patient man. The scheduler assured me that he had a great track-record coaching kids. I asked the question again and assured the woman on the other line that I have been known to drive people to drink after whacking balls at a local driving range. I was joking (only just) when I suggested kevlar and helmets for all involved in the class and within a 50-yard radius of practice. Anyhoo, I am so excited. Giddy. I’m not sure if it’s a good idea to give a slightly stressed-out coordination-challenged human a golf club to swing, but doggone it, I’ve paid my fee and am going to do it. Why golf? Why now? There is something missing after this last season – perhaps a sliver of self-consciousness or the genetic code for wisdom. Perhaps I am inspired by the Earl Woods National Golf Academy that has been hosted here, in his hometown, at Colbert Hills and via Kansas State University. We share the same alma mater and who knows – we both may learn how to swing a bat club. And I have a plan: first golf then tennis. I could enjoy learning how to raise a racket. This entry was posted in Signs of Life, There is a lot I don't know and tagged deathrace, focus, foolishness, golf, life, season, signs of life, tennis, wisdom. Bookmark the permalink.